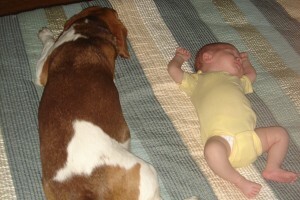 There are many reasons why raising a child alongside a family pet is a good idea. Some scientific research has shown that when infants are exposed to pets in their first year of life they are significantly less likely to develop certain common allergies and asthma. I also believe that young children who live with pets have an opportunity to learn and experience some important social skills that children without pets may miss out on. For one, I think young kids may learn empathy a little sooner when they live with a dog (or other pet) whose emotions are expressed in a very visual or audible way, e.g. “Hazel is yelping because pulling her ears makes her feel bad. Please don’t do that.” or “Yes, Hazel’s wagging her tail. It makes her very happy when you give her all the food Mommy just spent an hour making.”). And if your pet is constantly by your child’s side, as mine is, your child may quickly learn the joys of sharing — which is why I’m constantly reprimanding Hazel for chewing on Lilly’s shapes and telling Lilly to get Hazel’s Kong out of her mouth. Finally, there is the loyalty and companionship. The anecdotal evidence of this one is infinite. Ask anyone with a pet. I know firsthand how important this can be for a child. As the third and youngest child in my family, with a significant age gap between myself and both of my siblings, our family dog was my best friend for many years. He was always happy to play with me, nap with me, listen to me, and lick my tears away. That kind of comfort and unconditional love is priceless. I have to admit there are days (many days) when having Hazel constantly underfoot and vying for my attention is just too much and I would love to just throw her into the yard or her crate and pretend we don’t have a dog for a little while. Spending the day chasing after a toddler is tiring enough. Throw in a dog like The Nut or one of Mowgli’s vomit-fests and it is downright exhausting. But, rest assured, Hazel is never thrown to the wayside. The truth is, when Hazel is not around, even for a short time, I miss her and her incessant need to keep my floors free of food. And, more importantly, Lilly misses her. In her short life, Lilly has already discovered the joy of pet ownership. Every morning, Lilly wakes up, gets her diaper changed and immediately signs dog and then points to Hazel’s room (aka my office). She spends at least 40 minutes of every day just giggling and squealing with delight over something that Hazel is doing. We also spend a few minutes every day “hunting” for our elusive feline housemate. He is usually nowhere to be found, but occasionally Lilly will spot a black and white blur through a doorway and giddily sign cat and start meowing. Every time Elliott and I see Lilly’s excitement over her every interaction with the pets, we know that there is one gigantic reason why we still love having pets in our home. Just this evening, after a day packed with family fun and good moods, Elliott and I were preparing to take Lilly on her first ice cream outing. I put on Lilly’s shiny, new sneakers and sent her on her way. But since Lilly is nearly as fascinated by her shiny, new sneakers as she is by her pets, she ran away from me, head down, admiring how cute those sneakers looked on her quick-moving feet and BAM! Face first into the side of the counter. Tears came streaming down. I gave her lots of hugs, kisses and reassurances, but nothing helped. I needed reinforcements. Hazel responded immediately with ticklish sniffing and gentle face-licking. In no time, Lilly was giggling again and leaping out of my lap to hug Hazel. When Lilly was born, Hazel lost her prized-position in this family as “baby” and chief entertainer. As a dog-lover and mother, it is very rewarding to see her finally embrace her newer and much more important role in this family: official booboo-healer and tear-licker. The Baby’s Best Friend by MushBrain, unless otherwise expressly stated, is licensed under a Creative Commons Attribution-NonCommercial-NoDerivs 3.0 Unported License. Terms and conditions beyond the scope of this license may be available at mushbrain.net.